Today’s post I have to give props to Biz at My Bizzy Kitchen. 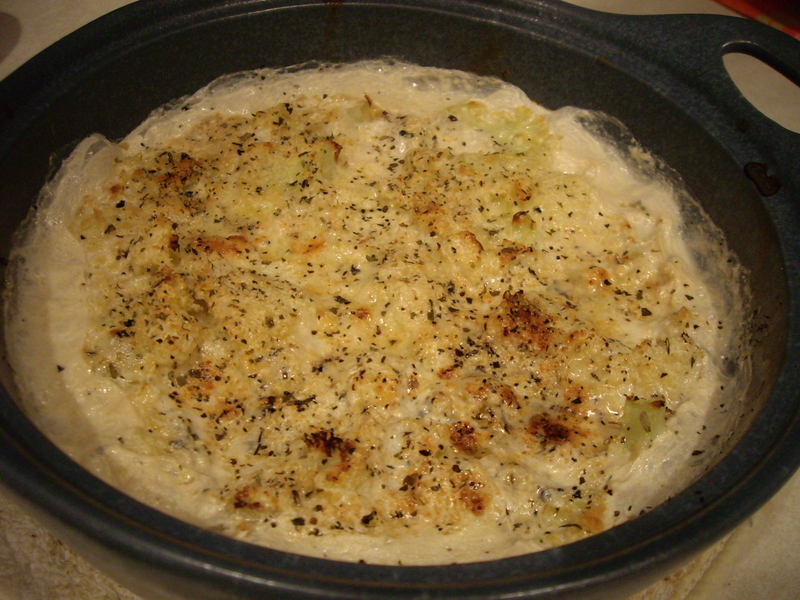 (see the original recipe at My Bizzy Kitchen)The cauliflower au gratin part of the recipe is from her blog and it is so good I had to rave about it today. I had to make a few changes to the recipe only because I didn’t have all the exact ingredients. Original recipe called for skim milk, I didn’t have any so I used fat-free half-and-half; original recipe had mozzarella cheese and blue cheese, I used swiss and gorgonzola, which I had. It still came out great. I also didn’t cook the sauce long enough for it to thicken but it still came out great. There were no leftovers which is a good sign it was edible! 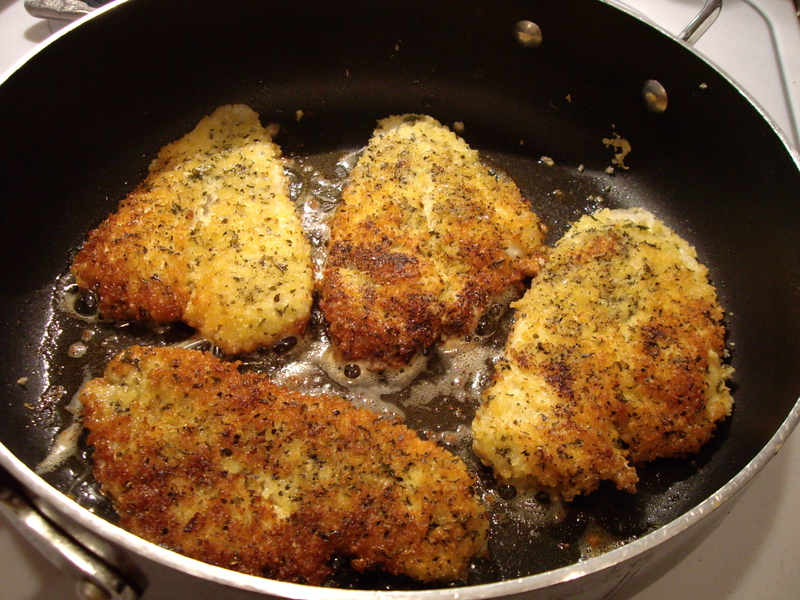 I served it with panko crusted flounder fillets. For these I just dredged the fillets in a little soy flour, dunked in egg/milk mixture and then coated with panko bread crumbs. Just fry them in a large pan with enough oil to cover the bottom of the pan. You don’t need a ton of oil so don’t go freaking out that it’s fried. I used olive oil also. Actually the entire dish is pretty low-calorie. Lots of protein and vitamins! So before you look at the finished photo remember, the sauce was a bit watery! But, I also discovered that it tastes great poured over the fish as well! (no pic of that of course!) So all in all I would make this again. Very easy actually and cooked pretty fast. Oh also, the original recipe called for cooking the cauliflower first on the stove in water. I cooked mine in the microwave. Less heat since I was using the stove for the flounder and the oven was heating up for baking the cauliflower. 1. 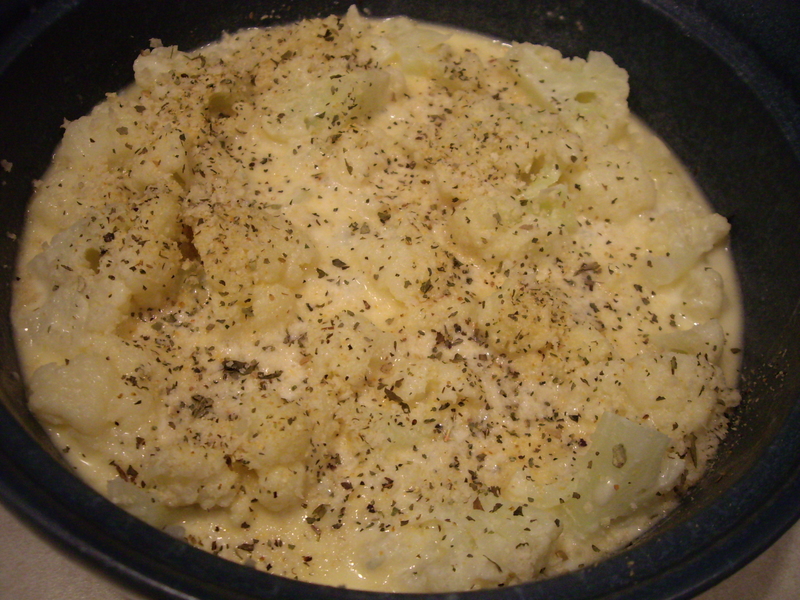 Place the cauliflower in a microwave safe container with about ¼ cup of water. Cover and cook on HIGH for 6-8 minutes, checking halfway through to see if it’s tender. Drain water when done. Set aside. Voila! 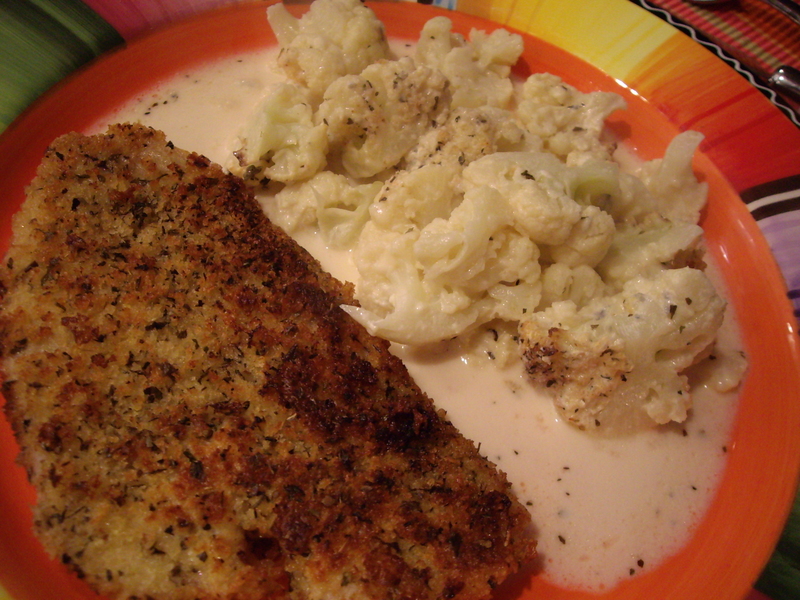 Flounder and Cauliflower au Gratin! I’ve Been Tagged! I’m It! Who is Next? 8 questions, Blogger Tag, Tag! You're It! I was just tagged by Dana of the wonderful Food For Thought blog. She is from NY and has wonderful recipes. This game has been going around a little while now between bloggers. I am so happy to be tagged! Thanks Dana! Everyone go check her site out now!!! Ok, so the rules are very easy for this game of Blogger Tag. Answer eight questions provided by your tagger (me) and then come up with eight new questions of your own! Once you do that you have to tag eight other bloggers to play along. Simple right! Go ahead give it a shot! I am going to have a hard time picking just 8 bloggers to tag though! There are so many awesome sites out there. Here I go with the questions Dana has asked. 1. What’s in your refrigerator right now? Wow, my refrigerator is packed at the moment. There are leftovers from our chinese food take out on Sunday, 4 ripe avocados (that I must make guacamole with now! ), cold cuts, broccoli, cauliflower, half-and-half, thawed out flounder fillets that I was supposed to make last night, eggs…Like I said, the fridge is full. 2. What is your favorite vacation destination (either one you have visited, or one you would like to)? Hmm this is tough. The favorite vacation destination I would like to visit is Italy. Never been there and we’re dying to get there, soon! Favorite vacation destination I’ve been to is tough too. I love cruises (been on 14 so far) but I think so far my favorite destination other than a cruise has to be Hawaii. We only got to Oahu but it was great. Also for quiet relaxation my family’s summer-house in Naples, Maine is another favorite spot. Life in the slow lane up there! 3. What is the last book you read? I am so far behind with my books. But the last one I read was Blaze by Richard Bachman (also known as Stephen King) I am now reading another Stephen King book call Duma Key. Stephen King is my favorite author. Got to see his house in Bangor, Me. a few times when we drove up that way. 5. If you could have any superpower, what would it be? Is there a “house-cleaning” power? I would love that if there was. But if not I guess being really fast. This way I could clean the house in no time at all! Or even to be able to transport myself to other places with a blink or thought. 6. Chocolate or vanilla? Vanilla! No thinking there. I like chocolate as candy. That’s it. But vanilla is my favorite for most things. 7. Are you neat in the kitchen? Nope. Though I do try. When I’m cooking I try and clean up as I go along so there isn’t a huge mess later. 8. What’s one little known fact about you? One little known fact? Probably that I am adopted. My family knows, obviously. But most of my friends and acquaintances do not. I was adopted at 3 months old and I never remember my parents telling me I was. I just always knew. Pretty cool actually. My brother that is a year younger is also adopted. Then my parents had 2 kids naturally. We used to tease my youngest brother by saying that “we were special, because we were chosen”. That my parents got “stuck” with him! Kids can be mean! But it was all in fun. Who is your favorite celebrity cook or chef? What food if any, do you really not like? What is your favorite cocktail, beer or wine? 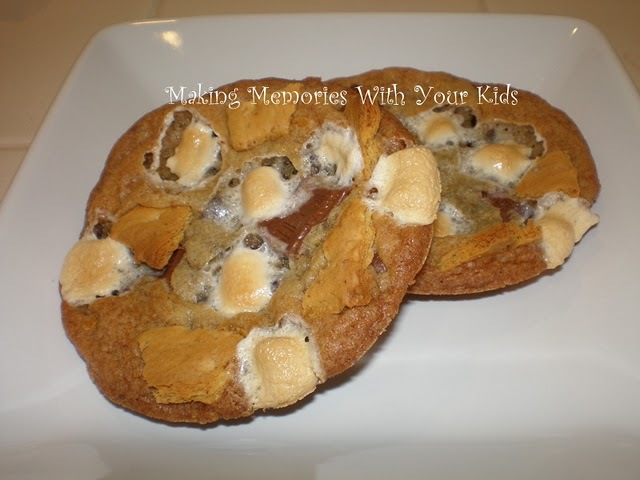 S’mores usually remind us of campfires, summer nights, scouts and just plain fun. I may be weird but I’m not a fan! Honest. I LOVE toasting marshmallows but I don’t like to eat them. I like graham crackers and chocolate but not necessarily together, with marshmallows. Yes I am strange. I also think of the movie “Half Baked” with Jim Breuer and Dave Chappelle. They kept wanting to make “S’mores man!” Funny movie. But still not a fan of the actual creation. BUT, as a cookie, that is another story. Remember, I really like cookies. I also am baking challenged according to my husband but these are so simple even I can make them. They are basically drop cookies which means you mix all the ingredients and just drop them on the cookie sheet. So with the holiday season starting up give these a try for something a little different! 1. Mix flour, graham cracker crumbs, baking soda and salt together. 2. 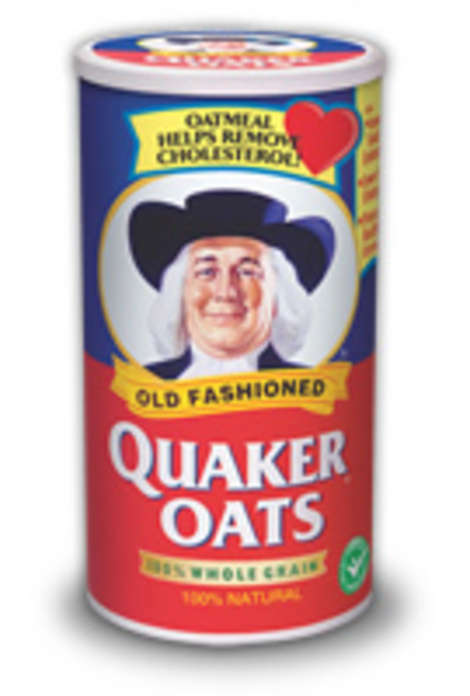 Beat butter, brown sugar, granulated sugar and eggs in a large mixing bowl. Add the vanilla. 3. Add in the dry ingredients and mix well. Add almonds, chocolate and marshmallows. 4. Drop by tablespoonfuls onto a nonstick baking sheet. Press the top of each cookie lightly with a fork dipped in water. 5. Bake at 350ºF for 12-14 minutes or until light brown. 6. Cool on baking sheet for 1 minute and remove to a wire rack to cool. Hey everyone! I know I was a slacker yesterday with my cocktail post. BUT, I have made up for it today. I was looking for a Oktoberfest martini or cocktail to put on here but everything I found for Oktoberfest was beer! Nothing wrong with beer. I love beer. But I wanted a martini! And we are going to a German restaurant tonight with our neighbors for a now “tradition” of Oktoberfest with the peeps. (Thanks Nancy and Steve!) They only serve beer and wine so I wanted something more to start the party! Anyway…I ended up finding a martini that was all about some of my favorite things. Amaretto and Creme Brulee. I LOVE two kinds of desserts. Tiramisu and Creme Brulee. They are the only two desserts I CANNOT pass up in a restaurant (though sometimes Key Lime Pie creeps in there too). 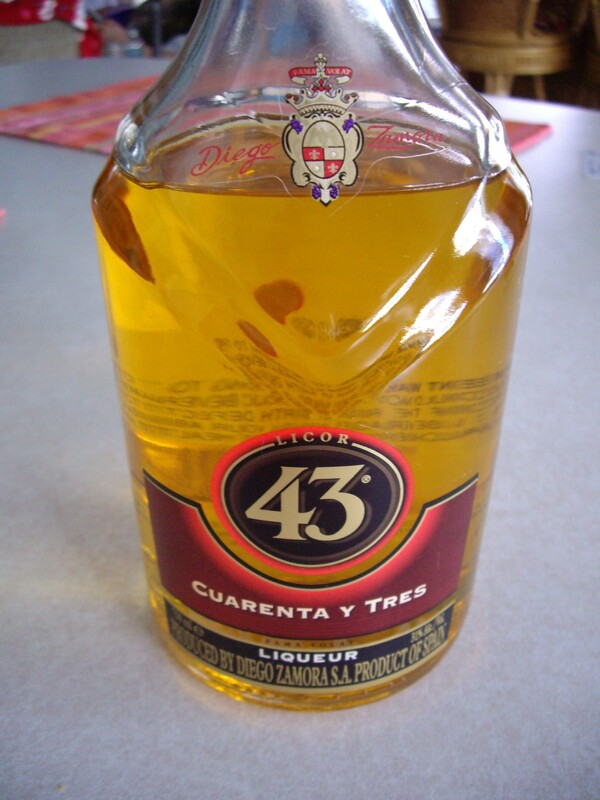 My fave liqueur is amaretto. 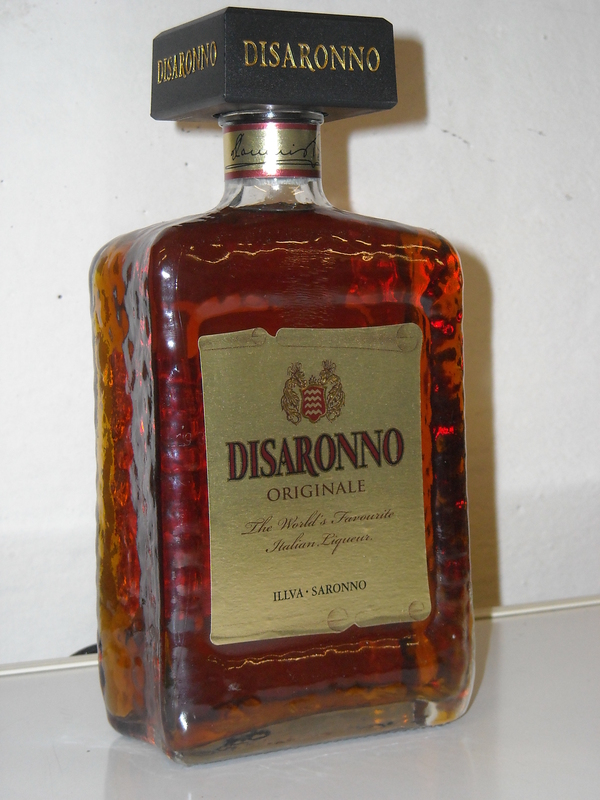 (DiSaronno only!!! There is no option of any other kind in my opinion) Love it!! So this cocktail was a must try. I also had all the ingredients for the most part. It called for a lemon wedge garnish, no lemons in the house. I used a raspberry. Prettier! And it calls for a splash of cream. I had half-and-half. Next time I will use cream for sure. 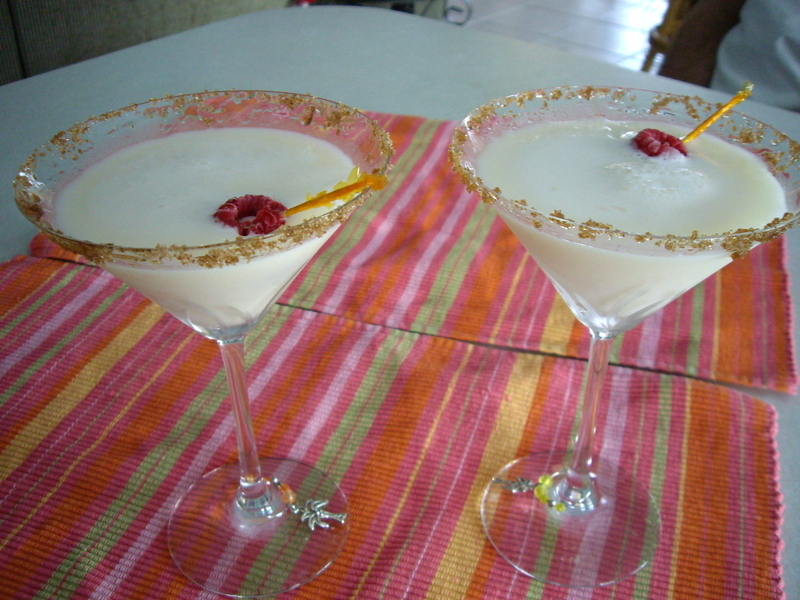 Ok, I made two martinis to try this out. Let me just say, it packs quite a kick! Good thing we don’t have to be at dinner till 7pm! Wow. I have to say I really liked this martini! Oh yeah, the recipe also calls for Van Gogh Vanilla Vodka. I recommend using that. We only had Absolut Vanilla (that we got a LONG LONG time ago from someone) Don’t use Absolut. I don’t know if it was because it was old or what but it had an aftertaste. Use Van Gogh. Really cool bottles too! Hey, is it hot in here?? (that’s another story!) But I have now put the Van Gogh on my list for the booze store. We have Total Wine & Liquors down here. It is the BEST store for booze, wine, beer…Like a warehouse for booze! And you can’t beat the prices. BJ’s here has a liquor store and they are close but they don’t have the selection. Rim chilled cocktail glasses with lemon and dip in brown sugar. Set aside to dry. Keep glasses chilled in refrigerator or freezer if you can. Pour all ingredients into a cocktail shaker with ice. Shake to blend and chill. Strain into chilled martini glasses! Garnish with raspberry or cherry! Ok I have no clue why these are called “Parisian”. Maybe because they dress up plain old frozen green beans into something fancy? I’ve never been to Paris, maybe this is how they serve them there. It could be because the French were the first ones to put green beans on their menus! No matter what the reason, this recipe is great. 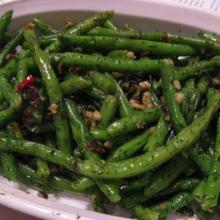 It’s different from your normal ho-hum green beans. As you all know I normally double or triple the garlic amounts in recipes but this one already has 3 cloves in it so I think that’s enough. It’s also got bell pepper flakes, which is something you don’t see too often in recipes. (It should be in the spice aisle). Dill weed and walnuts round out this recipe giving it that something extra. It’s a very low-calorie recipe, low carbs, and good fiber! If you have nut allergies, leave out the walnuts. My husband would also insist on putting parmesan cheese on top of these as well. Making it Italian/French! Bon appetit! 1. Cook beans as directed on the package. Drain any liquid off. 2. Heat a skillet on medium with the olive oil. Add beans to skillet. Add the rest of the ingredients and cook over medium heat for about 5-7 minutes. I am always looking for ways to make fish differently. The thing is that when I find a good recipe I tend to make it over and over and over…My husband loves when I use panko bread crumbs so I decided to use that and kick it up a notch. 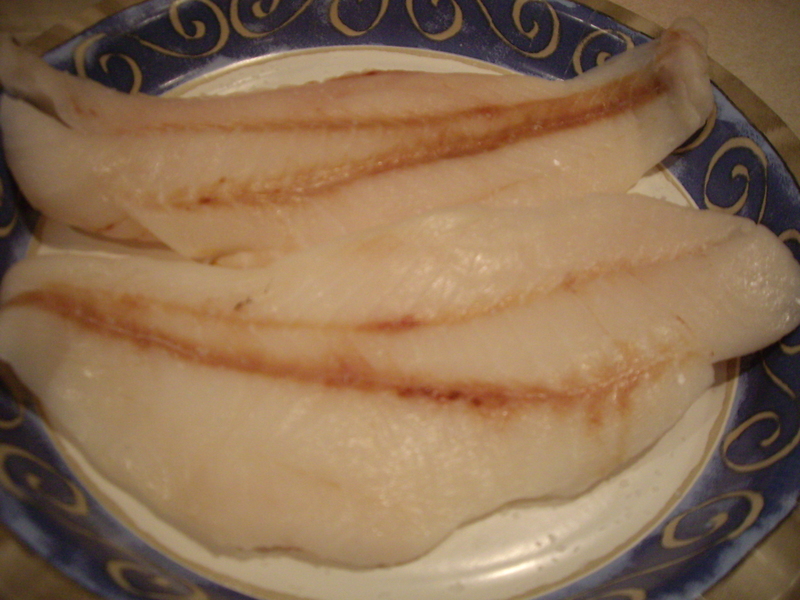 Orange roughy is a really tasty, white flakey fish. 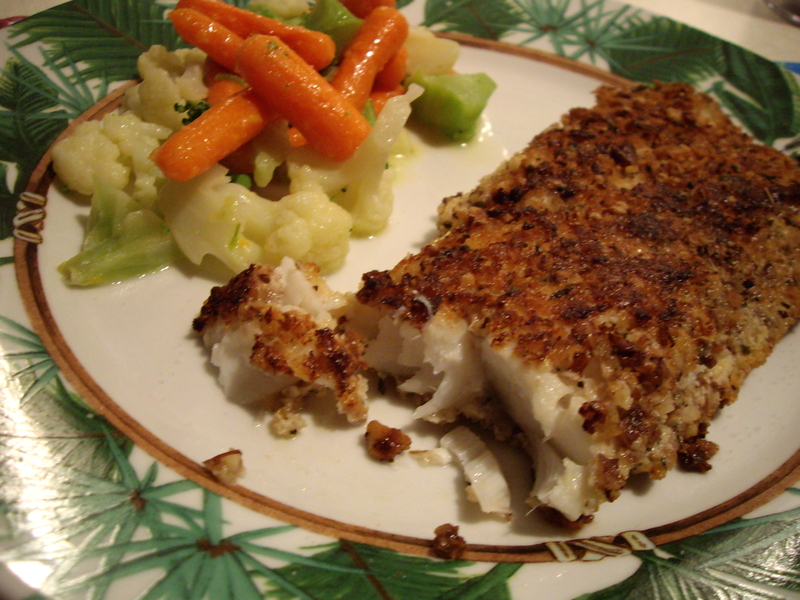 This recipe can used with any white filet, like flounder, tilapia, snapper etc. Orange Roughy was on sale at my supermarket this week so I bought it. At a restaurant the other night I had almond crusted brook trout. It was delicious. So I decided to used crushed pecans with my orange roughy. It was really the first time I tried making it myself. It came out incredible! I could have eaten another filet easily. I used soy flour in this recipe also as it’s lower in carbs but feel free to use regular or whole wheat flour. 1. Heat a large frying pan on medium heat. 2. 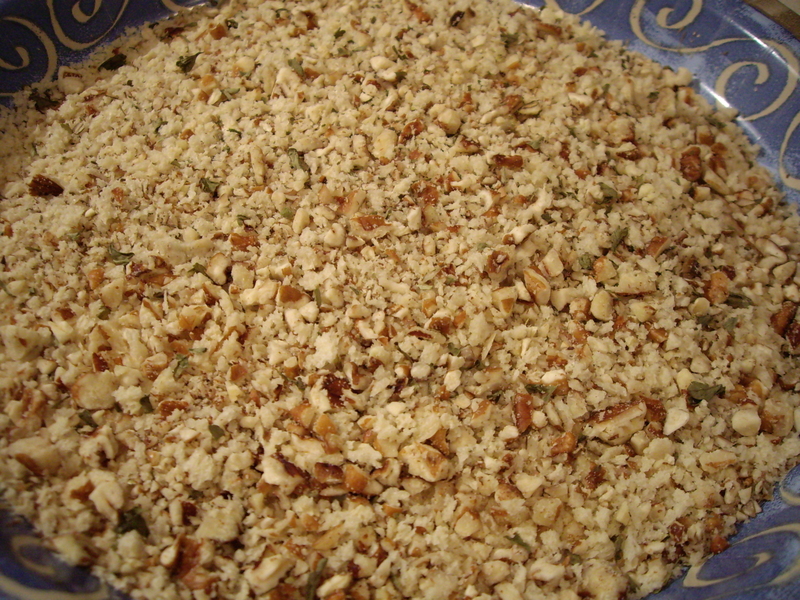 Combine the pecans and bread crumbs on one plate. 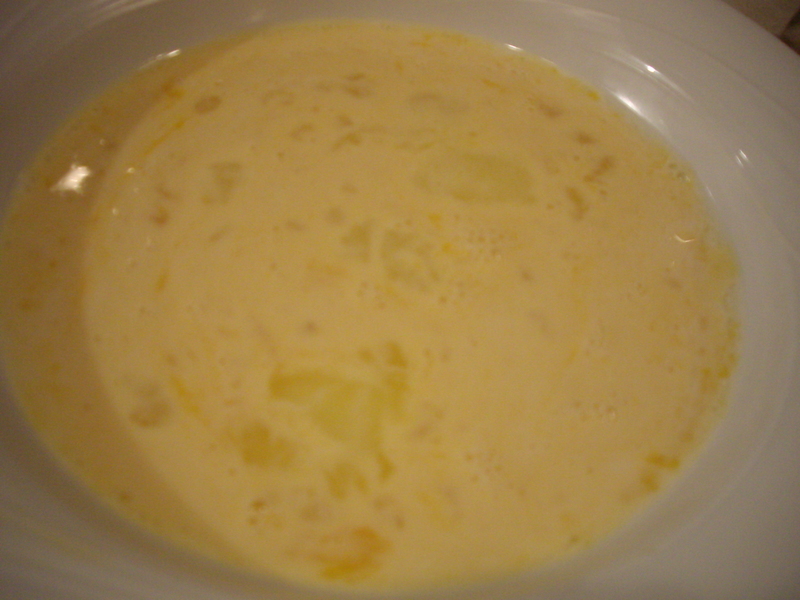 Combine the milk and egg in another bowl. 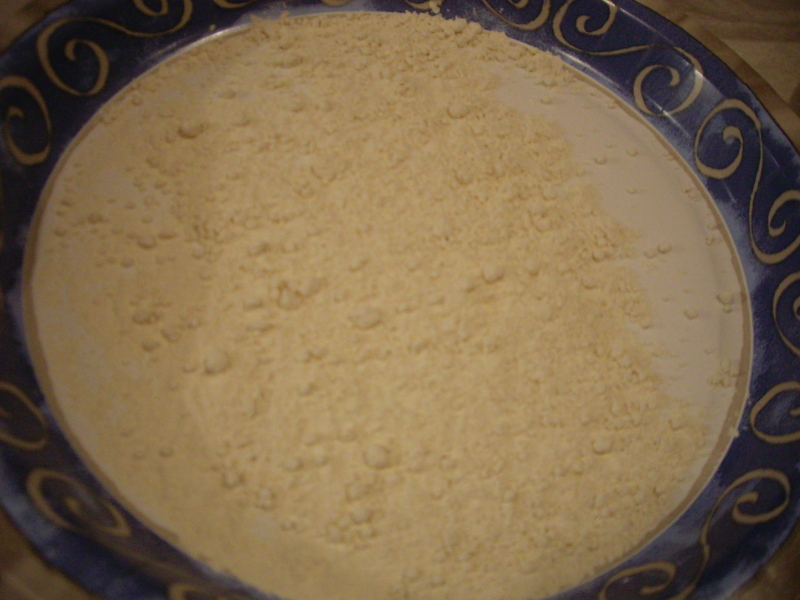 Place flour on a plate. 3. Season the fish with salt and pepper and dredge in the soy flour. 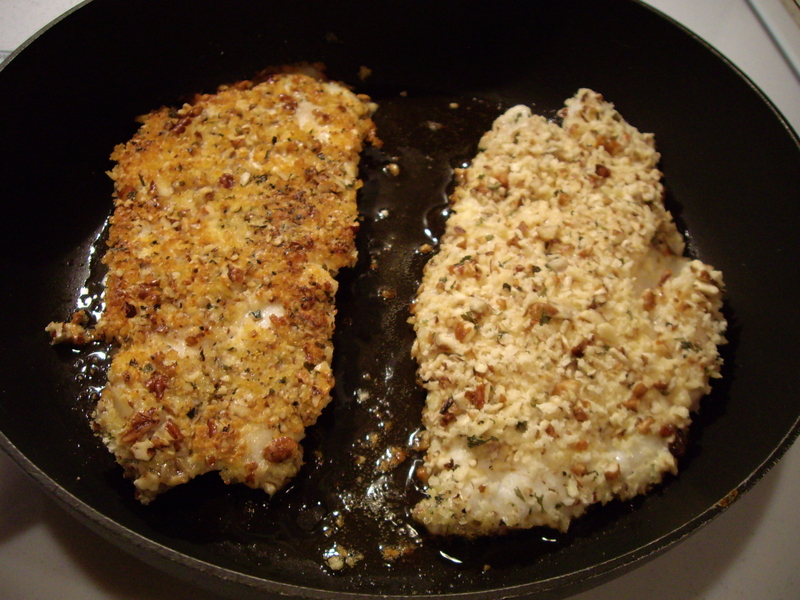 Then dip the fish into the egg/milk mixture and then bread crumbs/pecans. 4. Add oil to hot pan. Add fish to hot oil and cook 3-5 minutes on each side until fish flakes easily. Coating should be golden brown. The holiday season is just around the corner. It’s never too soon to start thinking of cookies for the holiday! I love cookies. I could pass up cake, brownies and pie (except Key Lime). But cookies are another thing. They’re smaller so I rationalize that it’s not as many calories. But then again for the most part if you are eating cookies you aren’t thinking of calories. Not usually anyway. So this recipe is not a low-calorie version. That’s ok though. We need the good stuff every so often! So whip up a batch of these delicious cookies and just enjoy them. Make a pot of tea or coffee and invite some friends over for a snack! They’ll love it! 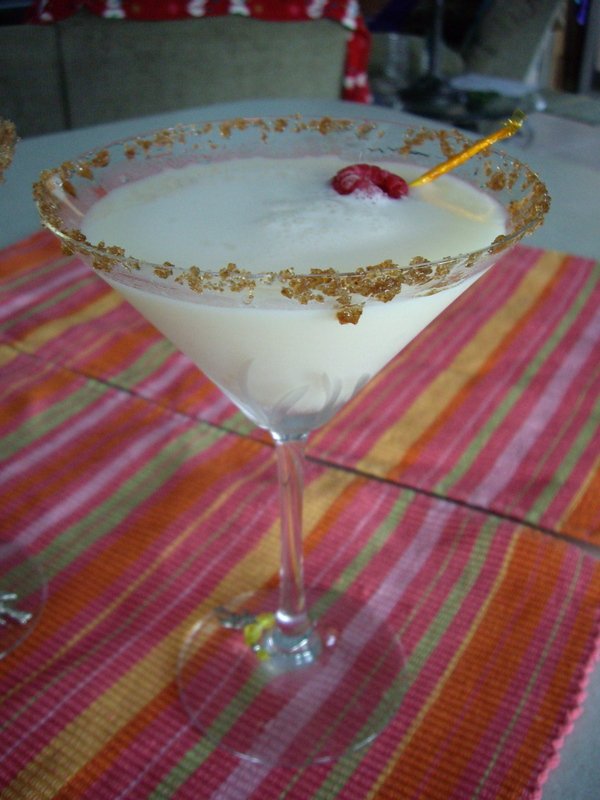 And my favorite liqueur is Amaretto so this cookie is a win-win! Sorry but there are no pics yet for this. When I’ve made them in the past I wasn’t thinking to take pics. Now I take pictures of everything! When I make them again I will add a photo. 2. Beat butter until soft. Add the sugars and beat until fluffy. 3. Add egg and amaretto, mixing well. 4. In a separate bowl, whisk together flour, baking soda and cinnamon. Add to butter mixture and beat until well blended. 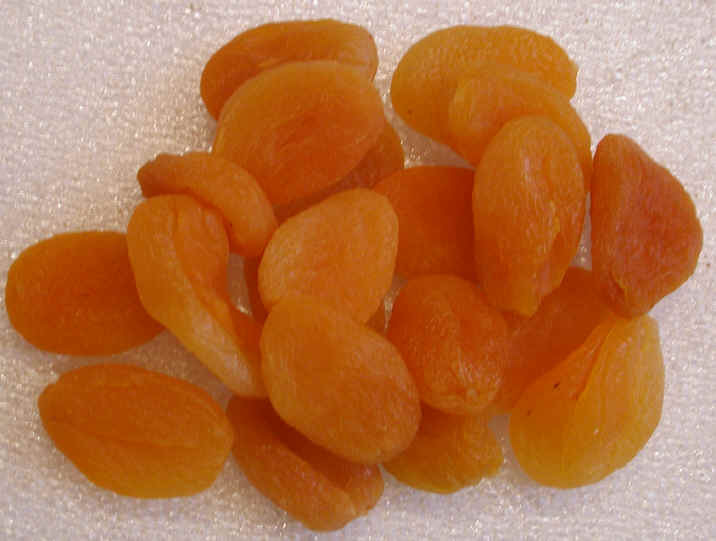 Stir in oats, apricots and almonds. 5. Drop by spoonful onto ungreased cookie sheet and bake 8-10 minutes. Remove from pan and place on waxed paper to cool. Whisk ingredients until smooth, adding amaretto until mixture reaches drizzling consistency. Drizzle over cookies.